Skiing and snowboarding are all about having fun! That is why we have a great Snow Sports School Staff whose focus is to help you have fun on the slopes. Whether you are new to the sport or are an experienced skier/snowboarder, we have trained instructors who can take you to the next level. 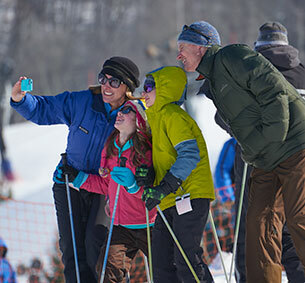 The First Time Ski/Snowboard Lesson is included with every lift ticket purchased. 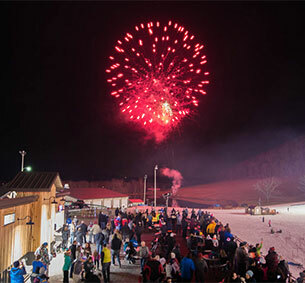 If you are new to skiing/snowboarding, we want to give you tips to get started out right and to have a good time on the snow. Our goal is to help you discover the fun of sliding on the snow, learning to control your speed and making those first turns through terrain-based teaching techniques. 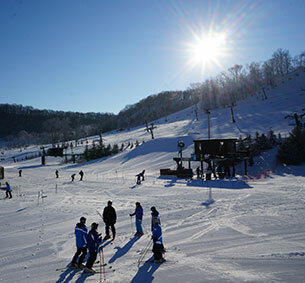 Take advantage of our First Time Ski/Snowboard Lesson for a great day on the slopes. Lessons are 50 minutes long and taught on the hour, from 10AM-8PM daily and 10AM-10PM during late night sessions, unless otherwise stated. To participate in this lesson, meet at the Learn to Turn Area (west of the West Lodge) at the top of the hour. Let our specially trained staff help your child improve their skills on the beginner area terrain. 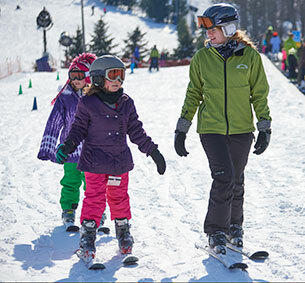 If your child is showing interest in snow sports, the Next-Step Lesson is designed to bridge the gap between the First Time Ski/Snowboard Lesson and their first chair lift ride. They will learn to control their speed and become more comfortable making turns. Lessons are 50 minutes long, taught on the hour from 10AM-8PM daily and 10AM-10PM during late night sessions, unless otherwise stated. Purchase this lesson at the Lesson Information Window in the West Lodge and bring the receipt to the Learn to Turn Area (west of the West Lodge) at the top of the hour. The Green Chair Beginner Lesson is the place to start enhancing your skills or to refresh your memory after some time away from the slopes. 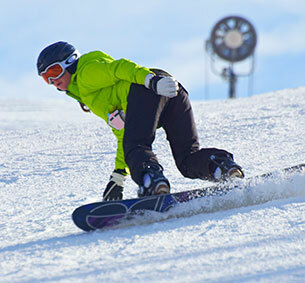 Learn the basics necessary to move from the beginner area to slightly steeper slopes. This 50 minute long lesson is designed for beginners to learn how to safely load and unload chairlifts and to control speed through turn shape. This affordable group lesson is offered daily at 11:00AM, 3:00PM and 7:00PM. Purchase this lesson at the Lesson Information Window in the West Lodge and bring the receipt to the Learn to Turn Area (west of the West Lodge) at 11:00AM, 3:00PM or 7PM. 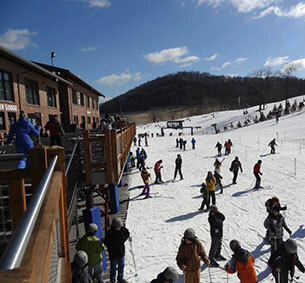 Take your skiing or snowboarding to the next level by taking a Private Lesson! We can work with you on basic beginner skills, linking turns on steeper terrain, carving, freestyle/terrain park skills, etc. Enjoy this lesson in a private 1 on 1 ratio format, or create a group of similarly aged and skilled friends or family for a group lesson (it is strongly recommended that children ages 4-6 have their own individual instructor). Lessons are 50 minutes long, taught on the hour from 10AM-8PM daily and 10AM-10PM during late night sessions, unless otherwise stated. The Adult Lessons Series is a great program for skiers and snowboarders who are looking to improve and advance their skills on the snow! These group sessions are broken down into different categories that build off of one another. This program covers a wide range of topics for both skiing and snowboarding. You may pick and choose which lesson(s) you would like to attend, as long as you meet the prerequisite skill set for any particular lesson. Visit our Children's Lessons, Adaptive, Adult Lesson Series, and/or Racing pages for information on additional lessons. Visit our Tips for First Timers page to obtain additional information about your first visit.